A seal was put back into the water by police on Saturday, only to turn up on the road again the next morning. An overly adventurous seal is back where it belongs — again — after a repeat visit to the streets of the Burin Peninsula this weekend, RCMP confirmed in a statement Tuesday. The seal was released back into the wild on the Burin Peninsula, with the help of the Department of Fisheries and Oceans, after police received a call that it was on the roadway and in the community of Burin Bay Arm, just a day after the animal was found near the front doors of the Burin Peninsula Hospital. 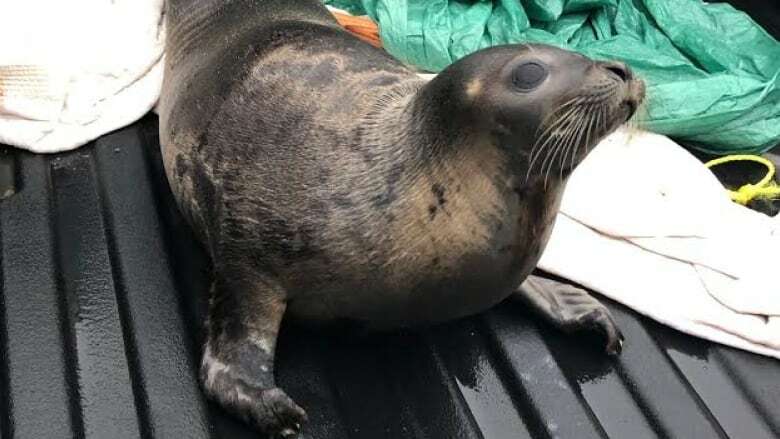 The seal first came to the attention of police Saturday, when it made its way from the water to the hospital grounds, according to the statement. Marystown RCMP returned the seal to nearby open water. However, the animal didn't stay put for long — the next morning RCMP received reports that the animal was back on the road, literally. Officers safely secured the seal in a police truck, and DFO helped bring the wayward wild animal to a more isolated area on the peninsula. The seal isn't the only marine mammal found where it does not belong this week. Several seals have been spotted in the Roddickton area in recent weeks, residents say, even wandering into the community and into roadways. As many as 20 of the animals have been seen together, the Canadian Press reported, and ice has made it impossible for them to get back to open water on their own. In their statement, the RCMP and DFO reminded people that it is illegal to disturb marine mammals, and dangerous to approach or attempt to catch them without proper equipment.